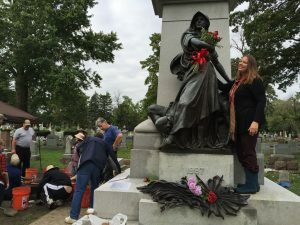 It’s been an open secret for almost two years that something important was buried next to the historic Haymarket Martyr’s Monument in Forest Park. On Oct. 3, archaeologists and volunteers dug up an object they think may be an 1892 time capsule containing letters, trial documents and other artifacts from Chicago’s Haymarket Affair. Tourists from around the world visit the 16-foot memorial in Forest Home Cemetery, especially on May 1, the international labor holiday. “Radical Row,” nearby, is the gravesite of anarchists, labor activists and other hell-raisers, including Emma Goldman, Haymarket widow Lucy Parsons and Joe Hill. 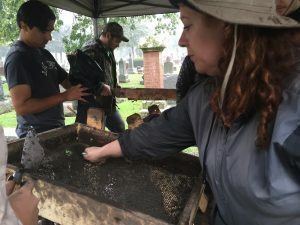 The excavation last week was organized by Rebecca Graff, an expert in urban archaeology at Lake Forest College and DePaul Archaeology Professor Jane Baxter. Graff visited earlier in the summer with ground-penetrating radar to give the group an idea where to dig. “I’m really impressed by how collaborative this project was,” said Graff. After a false start, the group pulled up a concrete tube, two feet long and one foot in diameter, capped with marble disks and buried at the southwest corner of the monument. The group also found a smaller concrete cube thought to be a cremation vault for the ashes of Haymarket martyr Oscar Neebe — pardoned by Gov. John Altgeld — who died in 1916. Cemetery personnel carefully shifted the cremation vault to reveal the cylinder. Cemetery law required that it be kept below ground level so it would not be officially exhumed, explained Debora Clark of Forest Home Cemetery. The capsule was taken to the studio of conservationists Bartosz and Andrzej Dajnowski. Cemetery workers immediately covered the vault once the capsule was removed. For labor historians, a potential of a Haymarket time capsule is a very big deal. In 1887, eight men calling themselves “anarchists” were convicted of conspiracy after the 1886 “Haymarket Riot” where a dynamite bomb exploded in a crowd of protesters. One Chicago police officer was killed by the bomb and six more died in the hail of bullets that followed. Four protesters were also killed, and many injured. eight-hour workday. Emotions were high because police had killed three striking workers May 3. At the trial, the court determined anti-police violence was incited by the German language anarchist newspaper Arbeiter-Zeitung published by August Spies, Michael Schwab and Neebe. Spies and three others were hanged and Schwab and Neebe were sentenced to prison. Louis Lingg committed suicide awaiting trial. “During the trial, the judge called the defendants, ‘those anarchist bastards,’” said Peter Alter, historian at the Chicago History Museum. “But it’s important not to judge late 19th Century jurisprudence by 21st Century standards,” Alter said. The ILHS will consult with paper conservators at the museum when the capsule is opened. she said. “Haymarket was about the fight for the eight-hour day, which finally became federal law in 1938, more than 50 years later,” Fortado added. Sculptor Albert Weinert designed the bronze figure of a woman comforting a fallen man atop the 45-ton monument. “Even mainstream newspapers consistently praise the artistry of the Monument,” Benton wrote. “Although there is usually a reference to the statue’s defiant attitude.” The image was not the female depiction of Liberty, as many assume, Benton found. Weinert’s design was actually based on the 1850 poem “Dei Revolutione” by Ferdinand Feiligrath. In the late 1970s and 80s, busloads of “labor pilgrims” from the Soviet Union and elsewhere would visit the martyrs monument in Forest Park, Fortado said. In 2012, during NATO demonstrations in Chicago, Forest Park police reported that “rowdies” had graffitied the monument and Goldman’s headstone with Sharpied messages and the “Circle A” anarchy symbol. The hunt for the time capsule had become the obsession of ILHS member Mark Rogovin, who gives cemetery tours and has authored a book about Radical Row. 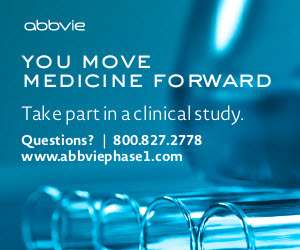 “We’ve been working on this so long, I’m really exhausted now,” Rogovin said. Benton followed the trail of the time capsule to University of Michigan in Ann Arbor, home to the archives of the Pioneer Aid and Support Society. The society provided for widows and orphans of the Haymarket martyrs, and built the monument. “It didn’t help that the minutes were all handwritten in Old German script,” Benton said. Sütterlin script was banned by the Nazi Party in the 1940s, and few people can decipher it today. The list includes newspaper clippings, letters and photos from some of the martyrs and their widows. Trial documents are also allegedly inside, including an essay called “What is a fair trial?” Unions such as the Socialist Men’s Choir, Progressive Cigar Makers Union and German Ladies Society also included documents. The capsule may also contain a 28-inch bust of Albert Spies, “created from a death mask with the marks of the noose visible,” according to reports. In 1892, more than 3,500 supporters came to witness the dedication of the monument, news reports say. Organizers said they wanted people in the future to understand the injustice of the Haymarket trials. “When generations to come dig up these records and read them, they will wonder that such barbarity could have been tolerated in the nineteenth century,” said Michael Britzius, president of the Cigarmaker’s Union, according to news accounts. Before anyone could dig in 2016, ILHS member attorney Paul Klenck had to obtain an expedited order from Circuit Court Chancery Judge Franklin Ulyses Vanderrama. “It helped that the judge’s clerks were members of the AFSCME union,” Klenck said. Even in pouring rain, students and volunteers scraped soil layer by layer and sifted for artifacts: nails, glass and colored marbles. Finally, DePaul Senior Morgan Krause heard a clink-clink sound as her trowel hit the urn vault. Below was the cylinder, which when rinsed with water, revealed a marble cap. The event drew onlookers like Al Scorch and Max Astell who realized they were witnessing history. Forest Park Mayor Anthony Calderone also stopped by. 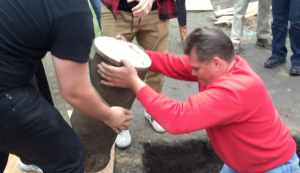 For volunteer Nikola Egedus, the capsule was especially important. 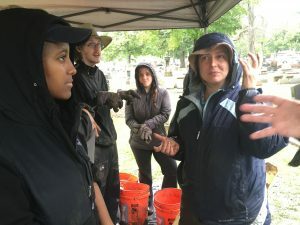 Egedus stumbled on the dig after attending a cemetery tour and volunteered for all three days. He belongs to the Chicago Carpenters Council No. 1027 – a union of cabinetmakers. “My union contributed to the restoration of the monument [in 2011],” Egedus said. It was Egedus who wrapped straps around the capsule and hoisted it out of the hole. Now that it has been found, the mysterious capsule raises more questions than it answers. For one thing, the shape is different than expected. A drawing from the News-Record depicted men lowering a large rectangular shaped box into the ground. That caused some concern when the vessel removed was cylindrical. However, cylinder-shaped time capsules were common in the 19th Century, according to researchers. Other contemporary accounts referred to a lead-lined box covered with concrete. ILHS has the capsule securely stored until it can be X-rayed and opened under supervision of conservation experts, said Rogovin. “We don’t know what is inside, or what shape it’s in,” he said.